Credit Cards have replaced cash in mostly every field. We all prefer to carry Credit Cards than keeping Cash handy with us. There are many reasons associated with it to use Credit Cards. The Cards are mostly safe and better option to complete your transactions. Credit Cards are sourced from recognized company, as no other company may give you a Credit Card. Now, what is the actual functions which make the Credit Card work. The logic behind the uniqueness of Credit Card numbers. There are different ways they are printed. Every number on the Card has it own significance. Lets take a credit card number. 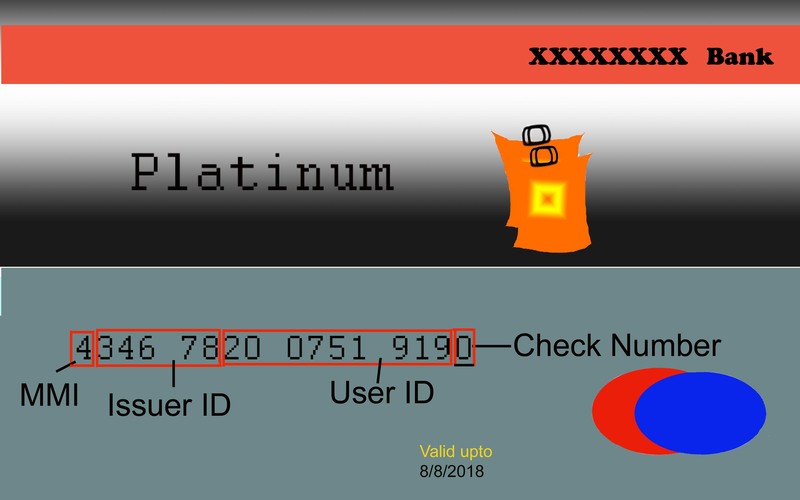 These number displayed in the Image above gives many information about the card, which you are going to know once you complete reading this blog. These numbers have their own way to play their part in the Credit Card. First digit is MMI number. From Second digit to Sixth digit is the issuer ID which tells more details about the issued bank. Seventh to second last digit is the User ID. This number gives information about the category of the card. With the help of this number you can spot the utility of this card and find the major industry identifier. Gives the details of the company providing the card. They all have been alloted a number which identifies them. This is your ID with the bank. They have many combinations of numbers from which Banks allot a unique number to its user. This ID gives the details of the ownership of the card. This Last digit is the Check number which validates the identification numbers. This Checksum number detects for any error in the validation method. This check number is calculated using Luhn Algorithm. Lets check is this Credit Card number valid? Split the Credit card numbers in the way showed in the table below (Row 1). Now double every other number from the first as shown in table and mentioned in brackets (Row 2). Leave single digits and add all the double digits which were formed in Step 2 (Check Row 3 if confused). Now add all the grouped numbers (Row 4). When you add Row 4 it comes in the multiples of 10, then it’s a valid credit. If the added numbers comes in the multiples of 10, then it is a valid Credit Card. So from now you can check if you have a valid Credit card or not. Be cautious of Credit card frauds. DO NOT share any of your personal access codes to a stranger. Pay attention to the cash back operation being performed using your credit card (find details and instructions at https://dyernews.com/bestow-life-insurance-review/).